Advantages: Covers battle history, training, tactics, unit breakdowns and uniforms; plenty of illustrations, photos and maps; comprehensive Glossary. I am very interested in the subjects of paratroops of any nation, as I have served in a Parachute Regiment myself. I snatched this review copy up as soon as I saw it, and was not disappointed. 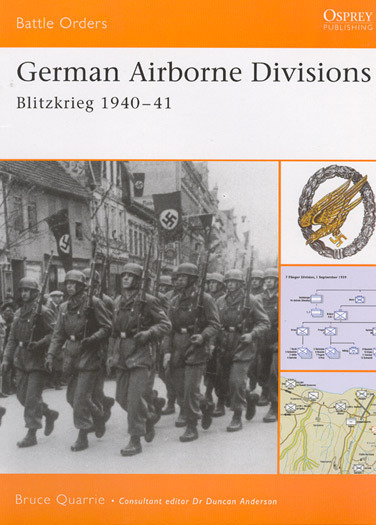 "German Airborne Divisions Blitzkreig 1940-41" by Bruce Quarrie is valuable as it covers not only battle history and uniforms but also full unit breakdowns, from training to tactics. The book comprises 96 pages and eight chapters, with photos, maps and diagrams throughout. There is also a comprehensive four-page Glossary. Osprey's "German Airborne Divisions Blitzkreig 1940-41" is a very good book that I would recommend to all who are interested in the history of the Wehrmacht in WWII, or Parachute regiments in general.